Pequeno Alpamayo, from the summit of Tarija peak. 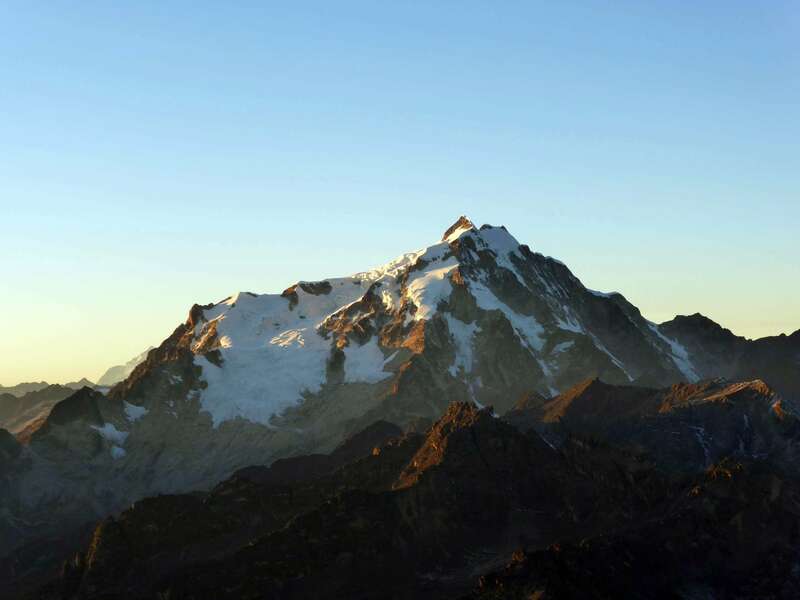 5370m Pequeño Alpamayo is one of Bolivia’s most famous mountains, and a popular climb. With a striking appearance and aesthetic normal route, Pequeño Alpamayo was one of my main climbing objectives in visiting Bolivia. Pequeno Alpamayo’s striking ridgeline seen in profile, from the summit of Piramide Blanca. Pequeño Alpamayo is named for its larger Peruvian cousin Alpamayo, considered by many to be the most beautiful mountain in the world. A part of the Condoriri range of mountains, the climb started with a ~2 hour drive from La Paz. 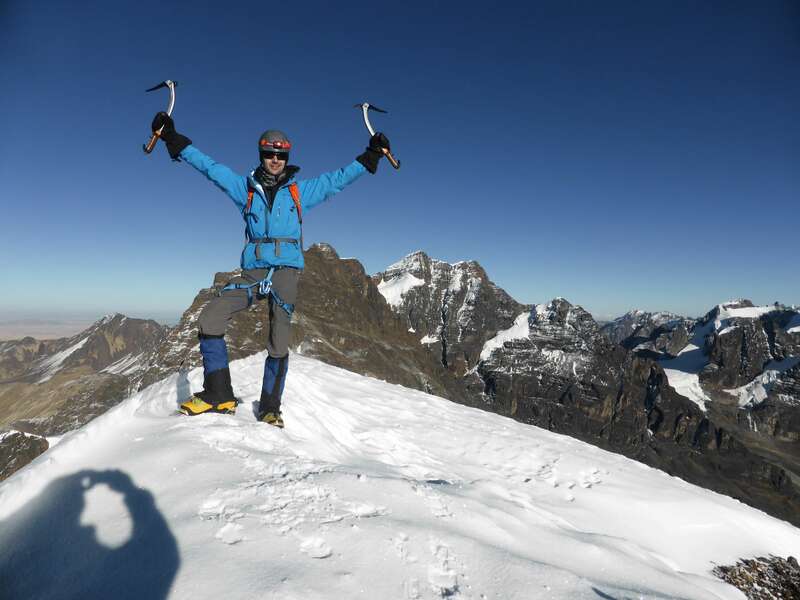 I planned to spend several days in the area, and tackle a few 5000+m peaks to acclimatize for higher climbing. The parking area and beginning of the hike to basecamp. The basecamp for the Condoriri mountains is a mountain lake called Chiar Khota. From the parking area we hired mules to haul our camping gear and food up to the lake, and set off with light packs. The hike into basecamp took around 2 hours at a leisurely pace. 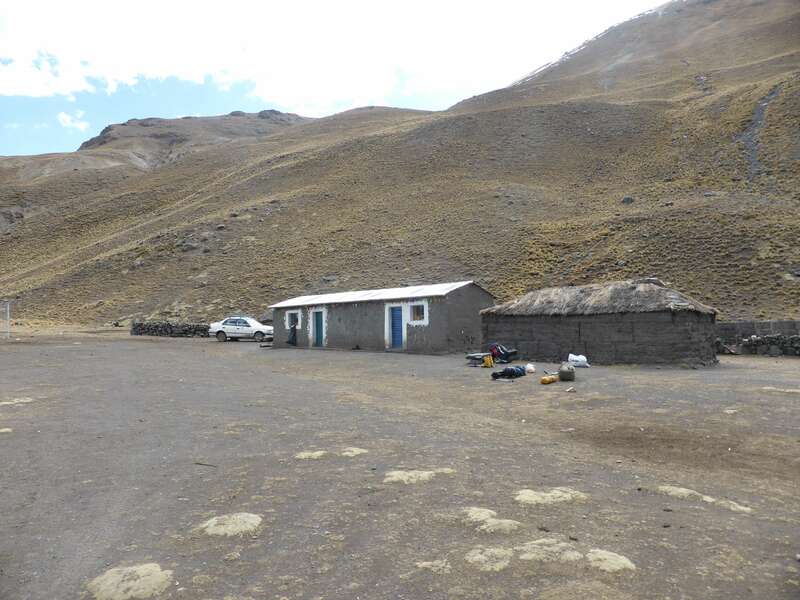 The basecamp sits at ~4700m and is a lovely spot, with great views of surrounding mountains. The main peak of the group, Cabeza de Condor, stands nearby. Cabeza de Condor, the highest peak of the Condoriri group, from basecamp. Cabeza de Condor, from the summit of Pico Austria. Prior to my ascent of Pequeño Alpamayo I spent a day ascending a nearby trekking peak, ~5350m Pico Austria, and an easy glaciated summit, ~5350m Piramide Blanca. This hiking, paired with several nights’ rest at basecamp, had me quite well acclimatized before beginning on Pequeño Alpamayo. Having already enjoyed some great views of Pequeño Alpamayo from the other summits, I was excited to climb its lovely ridgeline. The normal route on Pequeno Alpamayo, a direct ridgeline. 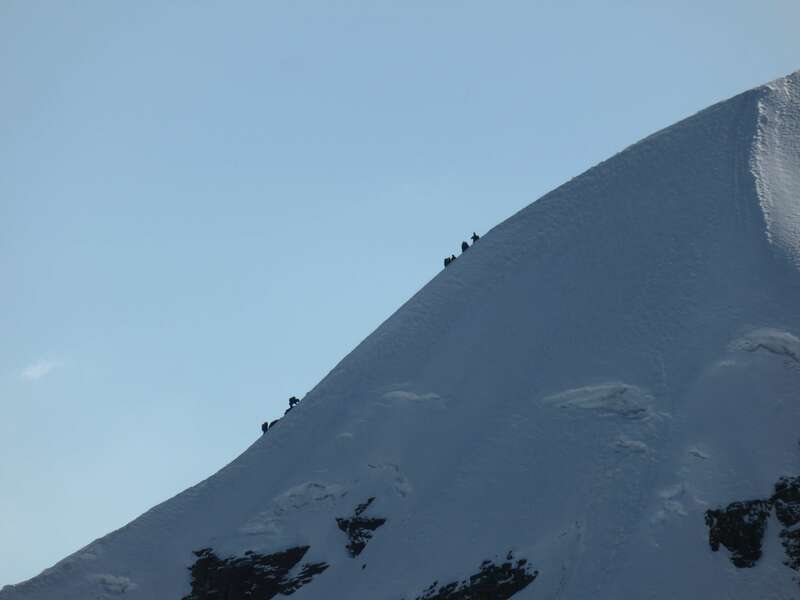 On the day I climbed Piramide Blanca several teams were attempting Pequeno Alpamayo and could be seen in profile. 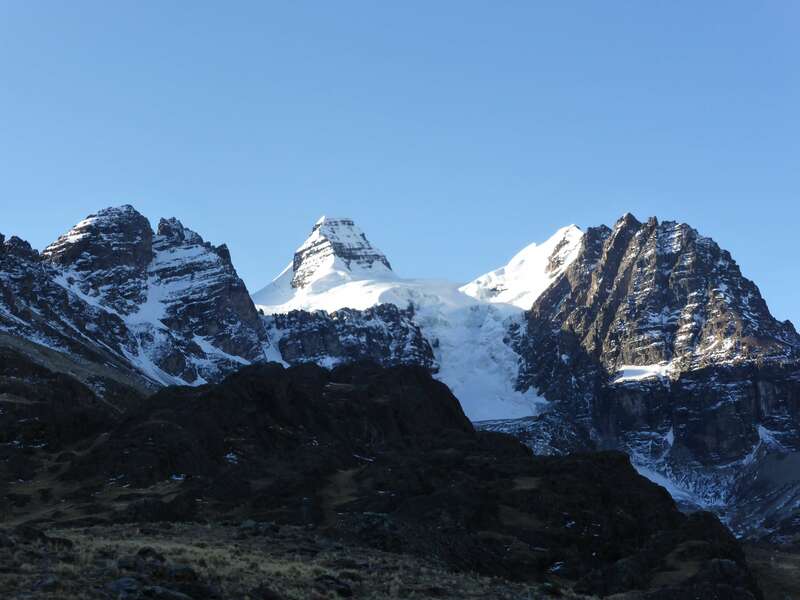 Awake early, my guide and climbing partner Gregorio and I started off from basecamp at 4:10 a.m., and quickly gained the glacier which leads to Tarija peak. Pequeño Alpamayo lies behind several other mountains, and is accessed by first ascending Tarija, itself a small 5000m peak. Gaining the top of Tarija was straightforward enough, as having ascended the same glacier the day prior while climbing Piramide Blanca Gregorio and I knew where the crevasses were. From the top of Tarija peak we descended down the other side, a fun rock slope to downclimb in crampons and plastic boots. I had read trip reports of this section being somewhat tricky, but with minimal ice and snow I found it to be an enjoyable scramble. At the base of Pequeno Alpamayo, Tarija peak behind me. Behind Tarija peak the real climbing began. Pequeño Alpamayo stood in front of me, absolutely gorgeous in the morning light. The mountain looked unreal, pristine and crisp. Having overtaken another team during the rocky descent from Tarija peak, Gregorio and I were the first two to climb the ridge, and had no other climbers on the mountain in front of us. From the base of Tarija a short flat section led to a sharp but nearly level ridge, which itself led to the base of Pequeño Alpamayo’s summit ridge. Climbing unroped to this point, Gregorio and I decided that the snow conditions were good enough to continue climbing separately and without using protection. Gregorio graciously offered to let me take the lead, and so the route lay open before me. At the base of the summit ridge, getting ready to cross one final crevasse. Gregorio and I reached the summit at 8:10 a.m., four hours after leaving camp and the first ones on top for the day. The snow conditions were excellent for most of the way up, with only a few short sections of ice. Climbing unroped and leading at my own pace felt fantastic, and kept me completely focused throughout the entire climb. On the summit of Pequeno Alpamayo. 6088m Huayna Potosi was prominently visible from the summit, and looked much closer than it actually was. 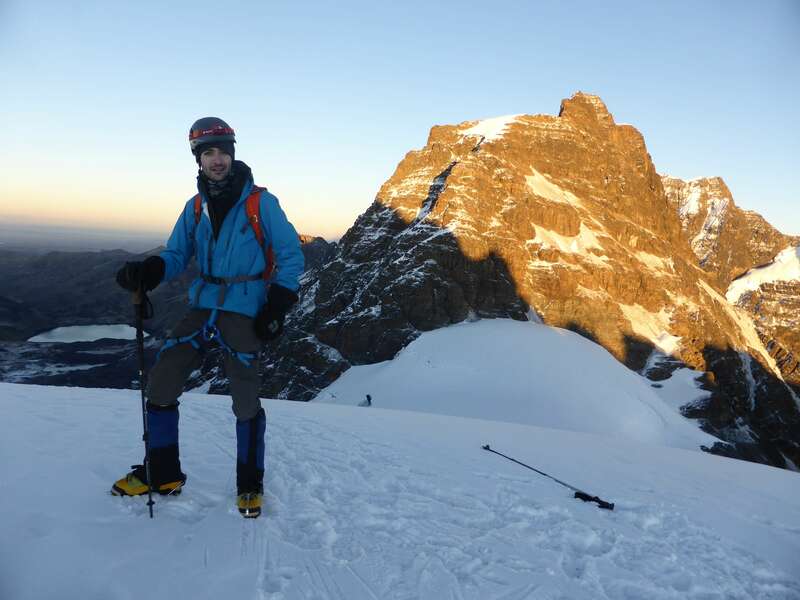 I would head to Huayna Potosi a few days later and ascend it in a single overnight push with Gregorio’s cousin Pedro. 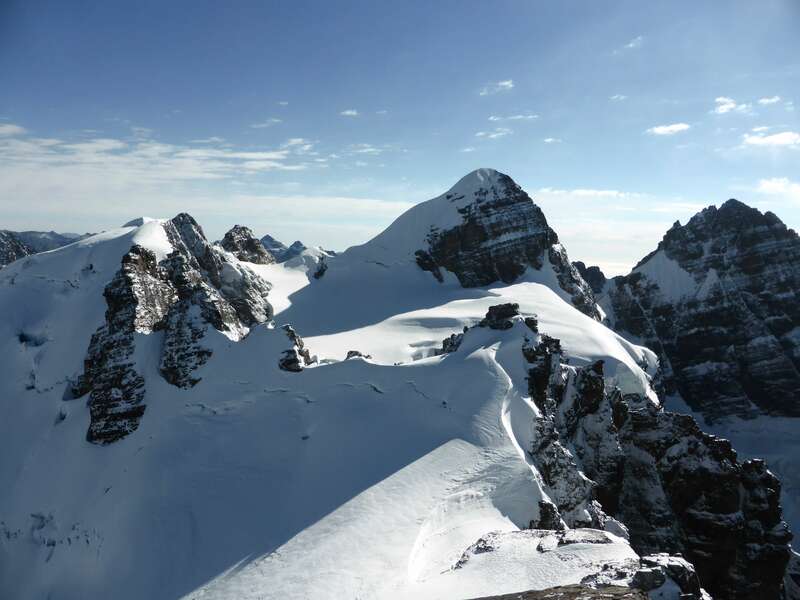 Huayna Potosi, from the summit of Pequeno Alpamayo. After spending some thirty minutes on the summit enjoying the views and resting, it was time to head down. Looking down the summit ridge from just below the top. We down climbed most of the way, but used a single rappel to get past the steepest middle section of the ridge. Our descent was fast, yet trickier than the ascent. 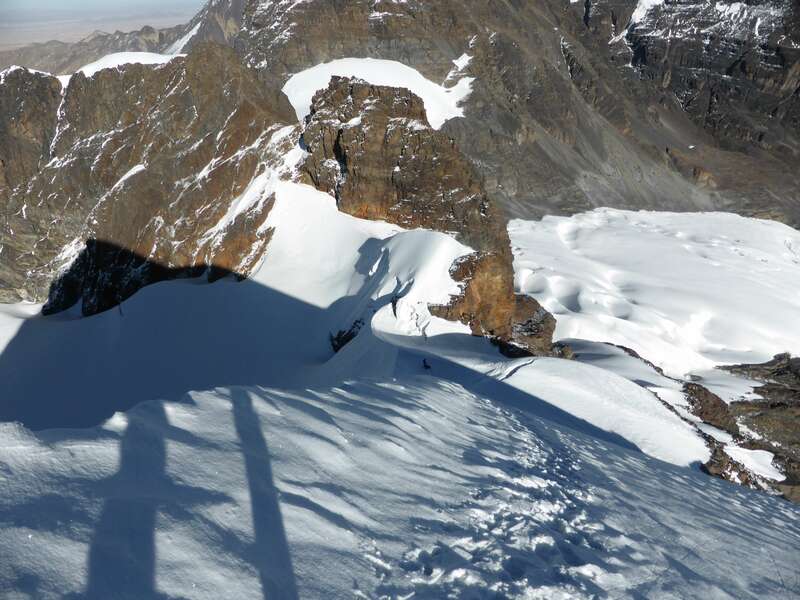 From the base of the summit ridge we crossed back to Tarija peak, scrambled back to the top, and began the long trudge back down the main glacier and to basecamp. Looking back at Pequeno Alpamayo from the base of the summit ridge. We returned to camp by 11:30 a.m., where I cooked up some lunch and took a rest in my tent. Pequeño Alpamayo had been a clean, aesthetically pleasing climb. 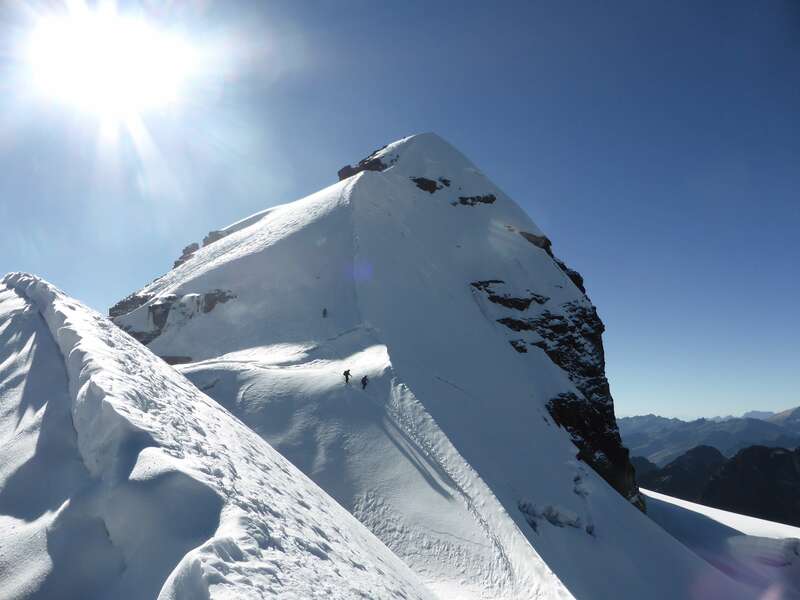 Climbing free and unroped to the summit was an incredible experience for both my confidence and focus. Gregorio was a pleasant climbing companion, and I was delighted that he let me lead the summit ridge – being the first to the top made the climb all the more unforgettable. Pequeño Alpamayo is a peak which I can see myself visiting again. 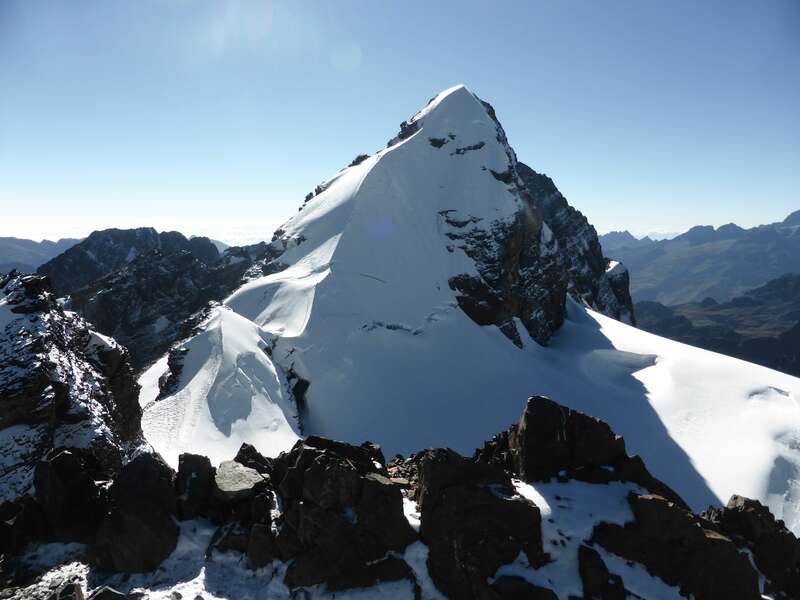 The Condoriri group is an ideal area to acclimatize for Bolivia’s 6000m mountains, and Pequeño Alpamayo is too lovely a summit to pass on. While Cabeza de Condor was an objective of mine on this trip I didn’t even manage to set foot on it’s glacier, leaving me with a strong desire to return. 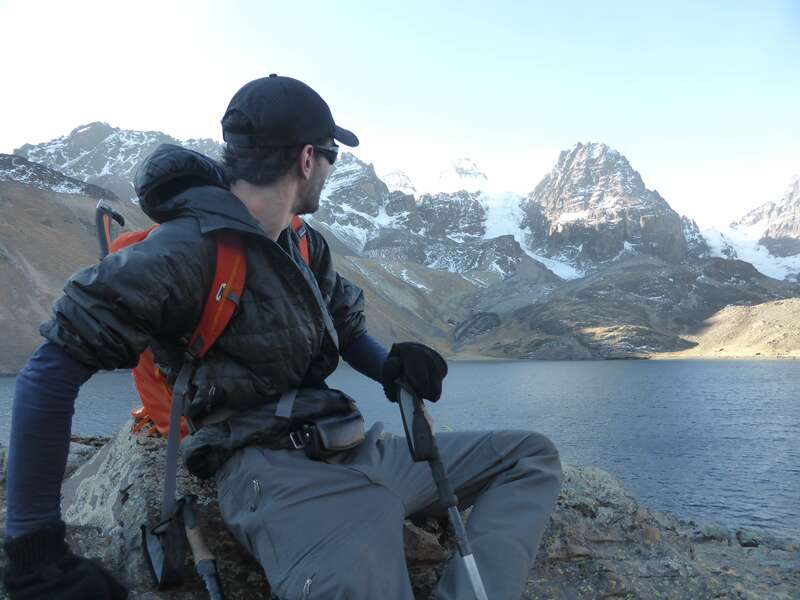 Pequeño Alpamayo is a very popular climb, and transport, logistics, or guiding services are easy to find in La Paz. There are no permit fees, but a small fee is charged on a per-tent basis by the caretakers at Chiar Khota. 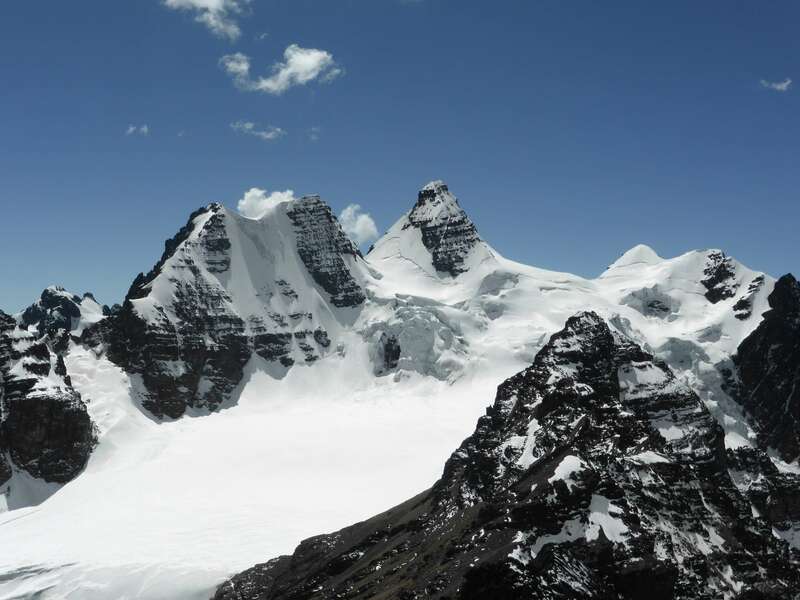 At just over 5000m Pequeño Alpamayo can be climbed fairly quickly after arrival in Bolivia. 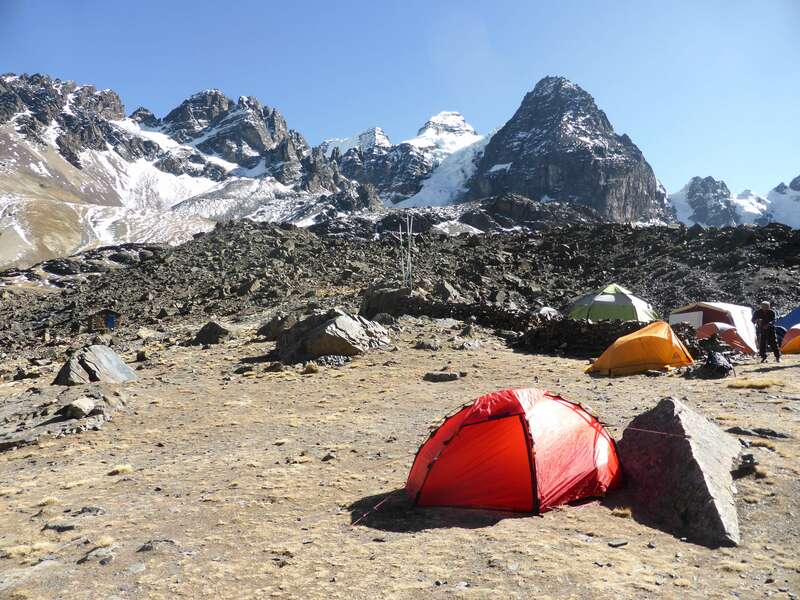 La Paz is a high altitude city, and a few days there paired with a couple of nights in basecamp would probably be adequate acclimatization for a strong climber. 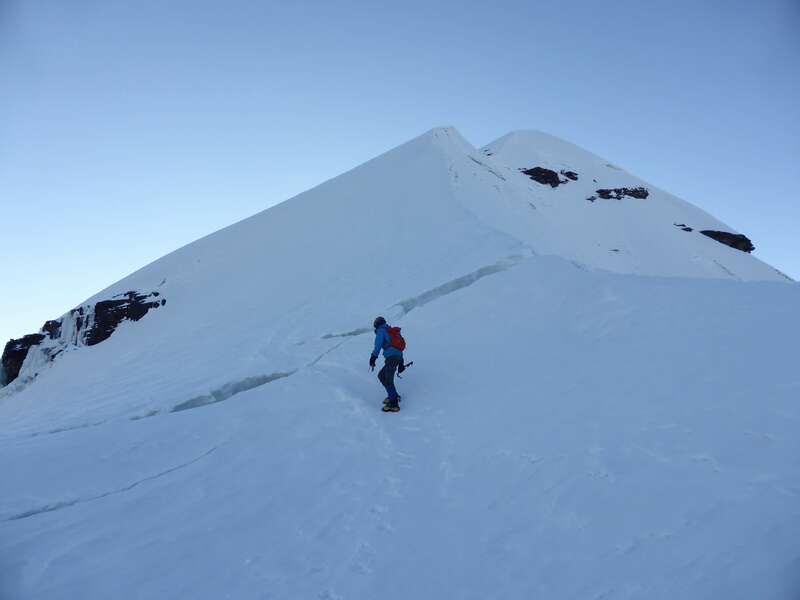 I acclimatized on nearby peaks before climbing Pequeño Alpamayo, and feel that moving slowly with acclimatization contributed significantly to my enjoyment of the climb. For logistics and a 1:1 guide I used the services of Eduardo Mamani and his company http://www.bolivianmountainguides.com/. I climbed with Eduardo’s brother Gregorio while in the Condoriri, and I met Eduardo’s nephew Pedro while hanging around basecamp. I later climbed Huayna Potosi with Pedro and Illimani with Eduardo himself. All three are certified UIAGM / IFMGA guides, and are exceptionally strong, professional, and personable. Eduardo and Gregorio have been climbing in Bolivia for decades, and have an astonishing amount of experience and knowledge. I highly recommend their services. When I return to Bolivia I will, without doubt, contact them again. 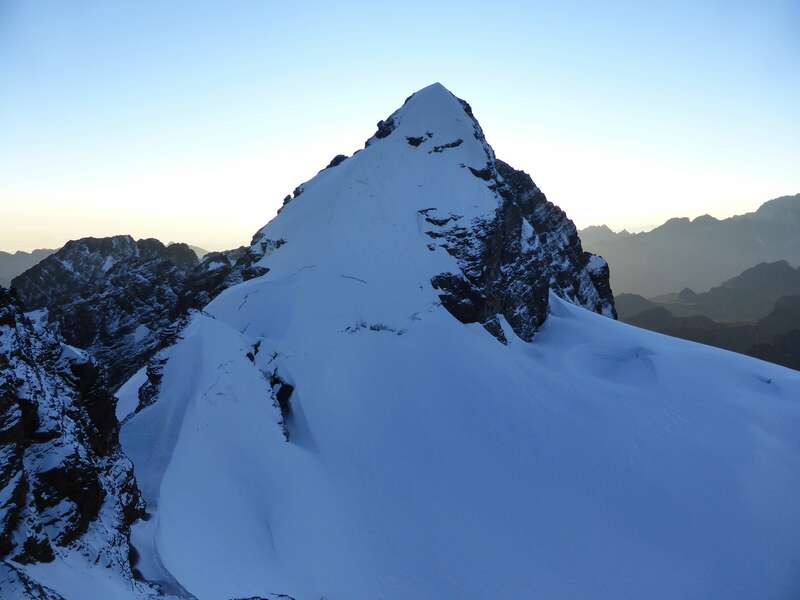 This entry was posted in Bolivia, Mountaineering and tagged Cabeza del Condor, Chiar Khota, Condoriri, Huayna Potosi, Pequeño Alpamayo, Tarija Peak by Ian. Bookmark the permalink.